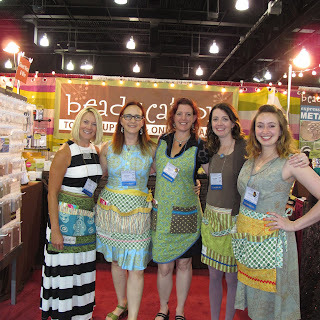 All year long, we gear up for the Bead&Button Show. It's our biggest trade show of the year. This year we had a triple booth in new location closer to the front of the showroom. Of the seven years we have been an exhibitor, this location was our favorite! The week was packed with both work and fun. We all arrived in Milwaukee on Tuesday night, sat down to some food and wine and planned out the week. Our booth came together in record time on Wednesday! A speedy setup left us with plenty of time to relax and see friends at the Meet the Teachers Reception Wednesday night. 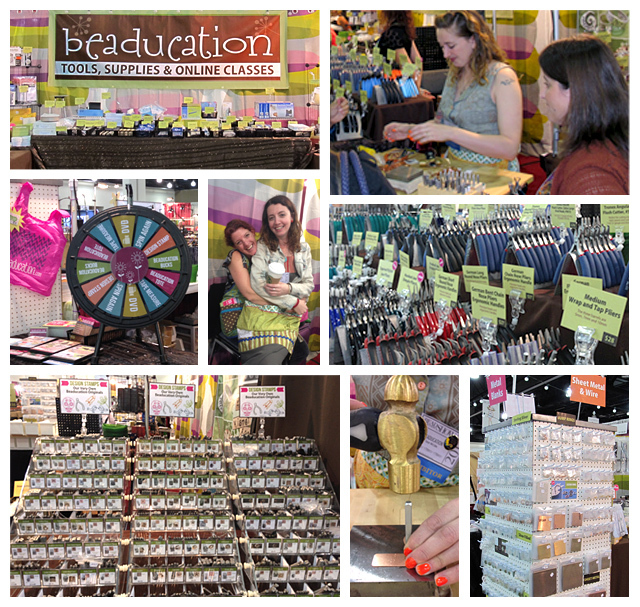 Thursday evening was the kickoff for the Bead & Jewelry Marketplace. This is always a busy night with friends greeting friends, beads flying, energy soaring and lots of creativity in the air. Our new Design Lead, Taryn, was manning (womanning?) the demonstration table. She had folks riveting, stamping, soldering, laughing and learning new things. Almost 1000 people came to spin our prize wheel and everyone walked away a winner. That was tons of fun and a great way to meet some new friends. Friday and Saturday, we hosted a free "Make and Take" where 16 people each day joined us to learn to stamp on metal, guided by Lisa (that's me!). Each person left with his or her own personalized pendant. I love teaching people how to stamp; it's such a fun and versatile technique. Below you can see a map of where all of the show attendees came from. Everyone was encouraged to pin their hometown. It's amazing how many international visitors there were! We met people from Australia, England, Japan, Czech Republic, El Salvador, South Korea, Turkey, Norway, Ukraine, Thailand, Saudi Arabia and more! We want to give a big shout out and THANKS to the hardworking staff at Kalmbach! And thanks to all of our customers who came by to say hi and and shop with us. It was wonderful to see you all! We put together a video so you can see what you missed if you were not able to attend the show this year. If you haven't ever set up a large trade show booth, you can see just how much work it is! I was there!! My first time to attend a Bead show and it was great. The only bad thing was I ran out of money!! Had a list of "must buy" items and got them all. Then I had some cashola left and got some pretties that caught my eye. All in all it was a great experience and I will sure be back next year.